Since 2012, the Google Chrome web browser has been the most popular browser online. Quite recently, Google Chrome has been upgraded making it 28% faster, more secure and more battery- and power-efficient than its previous builds. If you have Fire TV then you should have Chrome installed too. 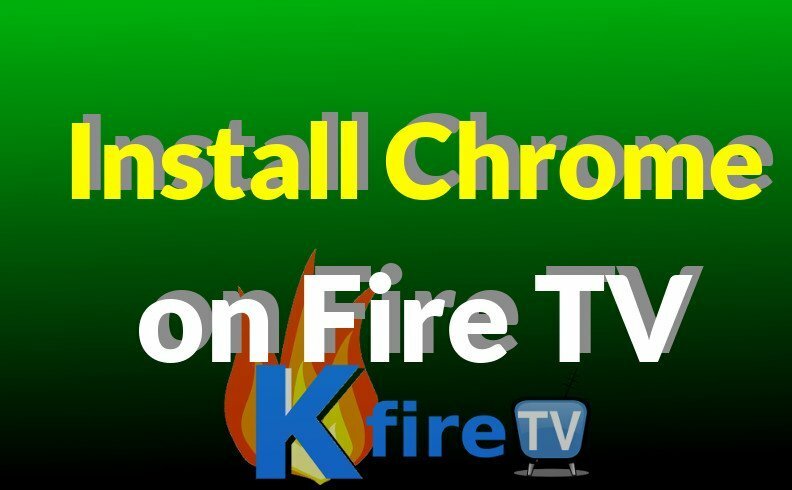 Use this guide on how to install Chrome on Fire TV and how to install Chrome on Fire Stick, so that you can browse websites on your Fire TV! With this tutorial, you can sideload Chrome in just a matter of minutes or install Chrome browser by using ES File Explorer. A side loader app is used to transfer Chrome to a Fire TV or Fire Stick via an Android device. There is also a method that can do this without the use of a phone or tablet but this guide uses an Android phone. This is by far the easiest method on how to install Chrome to a Fire Stick or Fire TV. You need an Android device to start. From your Android phone, install Chrome through Google Play Store. Install Apps2Fire or AGK Fire also from the Play Store on your Android phone. Locate your Fire Stick or Fire TV from the settings menu of your device and add this to the setup menu of the Apps2Fire or AGKFire. Find Local Apps tab of Apps2Fire or AGKFire and Install Chrome. The app will transfer or sideload to your Fire TV or Fire Stick. Since it is a sideload, you can continue anything that you were doing. You can watch a movie, play games or check out YouTube videos as the download is happening. Your device will tell you when Chrome has finished installing. Simply launch it by locating it in the apps list. Click on the logo and launch. Some users complain that they are having trouble sideloading Chrome it may be installed via ES File Explorer instead. The method below uses ES File Explorer to easily download the Chrome APK file from Dropbox (just like we can do with Kodi, by the way!). As an easy alternative for the steps above, you can simply use ES File Explorer and a Dropbox account to install Chrome on Fire TV. Now on your Fire TV / FireStick go to Search, type “es file” using the Fire TV remote. Locate Menu and go to Search, type “es file” using the Fire TV remote. A pop up box will appear, select the first box and enter the link where you want to download Chrome from. Just google “chrome apk download” – then find an APK file and enter the site address in the popup box that appears after you clicked Add. Select the second box and enter “c” for Chrome and then click Add. Use the Fire TV remote to select More located at the bottom right corner of the ES File Explorer main menu. Click Open in Browser. The ES Explorer will ask what app you want to open the download with. Choose ES Downloader and your download will start. Once done, choose Open File to launch it. Choose Install to install the file. This should complete the Install Chrome on Fire TV process. Now you’re free to browse websites using Fire TV or Fire Stick! We recommend using a Bluetooth Mouse to navigate websites, which we cover in the section below. Chrome turns your Fire TV into a computer; you can browse webpages, surf the web and check out different multimedia elements in Chrome just like what you can do on your tablet, computer or laptop. However, the Fire TV remote may be too cumbersome to use. You need to install a Bluetooth mouse to allow you to easily click different items in Chrome, since the Chrome app for Android was meant for touchscreen devices (which the Fire TV is not!). Simply install a Bluetooth mouse using the “Pair Bluetooth Devices” area in your Fire TV and after a few seconds, you can already use the mouse to navigate easily through Chrome. And while a Bluetooth keyboard will make it easier to input what you need, a mouse will make it more efficient and faster to browse.